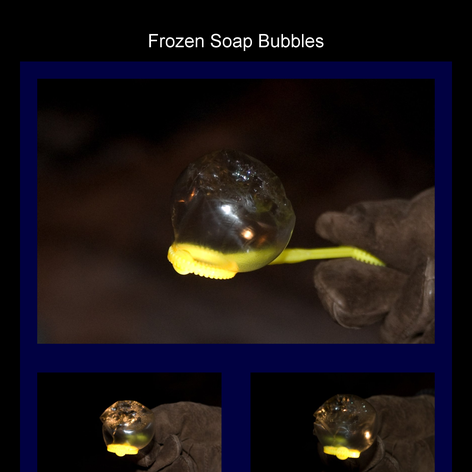 Last week I linked to some amazing photos of frozen soap bubbles. As we were expecting frigid weather of our own, I planned to try making some myself. The results weren’t as spectacular as his, but it was a fun experiment. There are a lot of factors to consider, I don’t know which contributed what to the outcome. The temperature was about 15 °F. The soap solution was standard Walgreens brand soap bubbles. The trick here is that drug stores don’t sell bubbles in the winter. We found a bottle lying around the house. We tried this over two nights, and the first thing we discovered was that it helps to chill the bubbles. When we were first blowing bubbles, nothing froze, and the longer we were outside, the better they froze, because the solution in the bottle was getting colder the longer it sat outside. One nice effect is that your breath is naturally cloudy on nights like this, so when you blow a bubble, it is filled with smoky breath. Even when the bubbles don’t freeze, it’s nice to see these smoke bubbles float away, and then pop, releasing your frozen breath into the air. Of course, your warm breath inside the bubble also helps prevent it from freezing, so one area to explore is ways of blowing the bubbles without breath. We didn’t have enough solution to use a waving wand to make the bubbles. Another possibility is to use a tube to blow through, so that your breath is chilled a bit before it forms the bubble. When the bubble does freeze, it’s fascinating to watch. You can see the frozen region expand over the surface of the sphere, in hexagonal shapes. In our experiments, it was rare for the entire bubble to freeze before it broke, though. When a frozen bubble did break, it became a crumpled membrane. It was beautiful to watch a flock of bubbles freeze and then break into tiny fluttering gossamers, and float away. Different than the summer soap bubbles I’m used to, but still fascinating. And as the pictures show, occasionally a frozen bubble would be large enough that it would land on the ground and just sit there, like a failed blimp. The best bubble mix I've found is the recipe that came with Bubble Thing - and it looks like they've updated it - http://web.mac.com/davidstein6314/bubblething1/BubbleThing_FAQs.html - haven't tried the update, though. Very interesting bubbles. In my country, winter is finishing and to get frozen bubbles, I have to use my deep-freezer. Hiii my passenger. Thierry-chiloedream.